Sydney Brenner, one of the giants of 20th Century science, has died. The South African of Lithuanian descent made many pioneering discoveries in the field of molecular and developmental biology, winning a Nobel Prize in 2002. 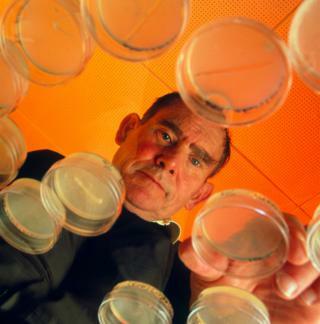 The Nobel recognised his work with the tiny roundworm Caenorhabditis elegans, which is now widely used by researchers as a model to test the fundamentals of how all living organisms work. But Brenner also made big contributions to the understanding of DNA. He worked routinely with the other greats in this area, such as Francis Crick, François Jacob, Linus Pauling and James Watson. Brenner helped establish the role played by the molecule RNA in carrying the "code of life" held in the DNA sequence to the ribosome protein factories in cells. He also realised the importance of codons - the sets of three bases, or "letters" - in the DNA sequence that signify the correct string of amino acids the ribosomes should use to assemble the proteins. It is the proteins - enzymes and hormones, etc - that ultimately construct and maintain our bodies. Born in 1927, Sydney Brenner had an impoverished start to life as an immigrant in South Africa, and famously taught himself to read from the newspapers that were used as tablecloths at dinner time. But his precocious talent saw him win a scholarship to medical school at the age of just 15. He later went on to study for a PhD at Oxford University in the UK, before moving across to Cambridge where he joined the hothouse environment of the Laboratory of Molecular Biology. The LMB produced a stream of Nobel Prize winners, and he was its second director from 1979 to 1986. In his later years, he put much effort into building scientific capacity in Singapore. And it was the Agency for Science, Technology and Research (A*STAR), Singapore's lead public sector research agency, that announced Sydney Brenner's death on Friday morning.